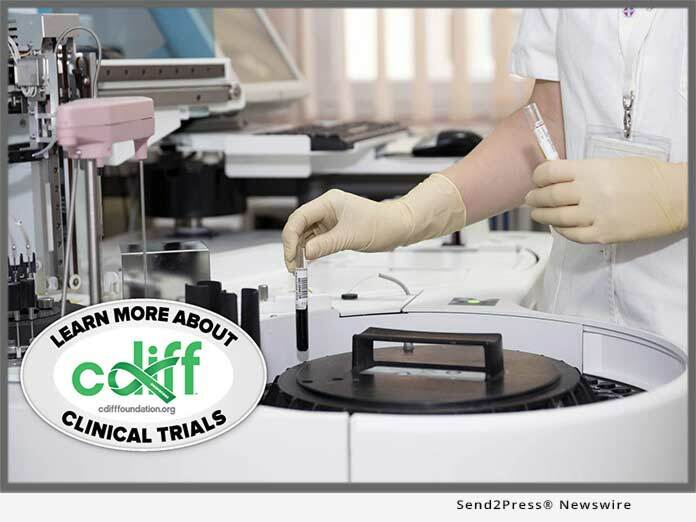 TAMPA, Fla., Feb 21, 2019 (SEND2PRESS NEWSWIRE) -- The C Diff Foundation announced today that their organization has implemented a global campaign to raise awareness of Clostridioides difficile clinical trials, clinical studies, clinical research and observational studies evaluating interventions for C. difficile prevention, treatments, and environmental safety. Clostridioides difficile is also known as C.difficile, C.diff, CDI (Clostridioides difficile infection), CDAD (Clostridioides difficile-associated disease) and formally called Clostridium difficile. In the USA: Nearly half a million Americans suffer from Clostridioides difficile (C. diff.) infections in a single year according to a study released in 2015 by the Centers for Disease Control and Prevention (CDC). Approximately 29,000 patients died within 30 days of the initial diagnosis of C. difficile. About 15,000 deaths were estimated to be directly attributable to C. difficile infections making it a very important cause of infectious disease death in the United States. "The broad range of new therapies for Clostridium difficile (C.difficile) is being intensely studied in several essential global clinical trials. This continued research underpins the current clinical needs with both preventing and treating C.difficile," stated Glenn S. Tillitson, Ph.D., FRSM, FCCP. To learn more about clinical research (e.g., Clostridioides difficile formally Clostridium difficile, also known as C.diff. C.difficile. CDI, CDAD) visit the U.S. Food and Drug Administration https://www.fda.gov/ or telephone 1-800-835-4709, and visit https://clinicaltrials.gov/. "Clinical trials are vital to improving our knowledge about how best to prevent and treat C. difficile infections. Informing patients of clinical trials is important, and in recent years several clinical trials have led to significant improvements in the treatments available for patients with C. difficile infections. Clinical trials are a vital way of making progress in our search for new therapies to prevent and treat a CDI," stated Mark Wilcox, MD, FRCPath, Consultant Microbiologist, Head of Microbiology and Academic Lead of Pathology Leeds Teaching Hospitals, Professor of Medical Microbiology University of Leeds Institute of Biomedical and Clinical Sciences, Lead on Clostridium difficile for Public Health England, UK. The FDA is responsible for protecting the public health by assuring that foods are safe, wholesome, sanitary and properly labeled; ensuring that human and veterinary drug, and vaccines and other biological products and medical devices intended for human use are safe and effective. FDA's responsibilities extend to the 50 United States, the District of Columbia, Puerto Rico, Guam, the Virgin Islands, American Samoa, and other U.S. territories and possessions. The C Diff Foundation, a 501(c)(3) non-profit, founded in 2012 with a global mission of providing education for C.difficile infection prevention, treatments, environmental safety and support through research being conducted by the government, industry, and academia and provide better advocacy on behalf of patients, healthcare professionals, and researchers worldwide. For information please visit http://www.cdifffoundation.org/.